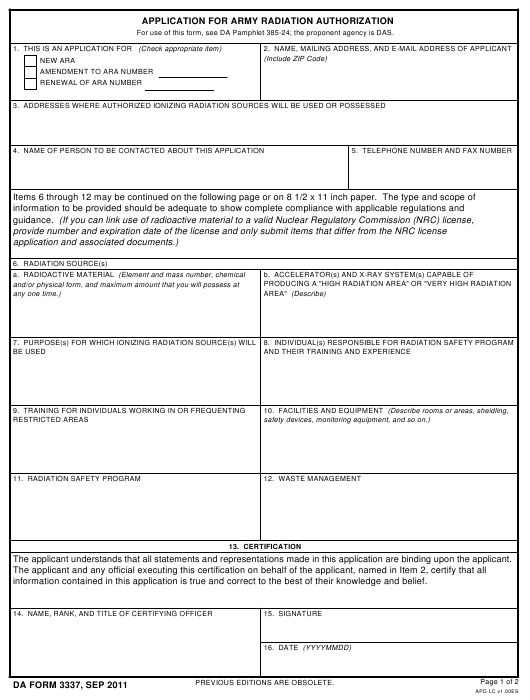 DA Form 3337 or the "Application For Army Radiation Authorization" is a Department of the Army-issued form used by and within the United States Military. The form - often incorrectly referred to as the DD form 3337 - was last revised on September 1, 2011. Download an up-to-date fillable DA Form 3337 down below in PDF-format or look it up on the Army Publishing Directorate website. For use of this form, see DA Pamphlet 385-24; the proponent agency is DAS. The applicant understands that all statements and representations made in this application are binding upon the applicant. information contained in this application is true and correct to the best of their knowledge and belief.